Get the code Video: Cloud deployment Video: Local deployment Try the app! The journey from mountaintop to countertop is long. Gaps in accountability and transparency open the door to delays and fraud. Enter IBM Blockchain. In this developer code pattern, we will create a blockchain app that increases visibility and efficiency in the supply chain of a coffee retailer, giving you a taste of traceable, trackable coffee trade. See how blockchain can help farmers, roasters, and everyone in between bring you a fresher, fairer cup. This code pattern shows you how to create a blockchain app that increases visibility and efficiency in the supply chain of a coffee retailer using IBM Blockchain Platform V2 Beta. You will use different transactions to show different possible actions for each of the participants in the supply chain. This sample application will record all transactions on the IBM Blockchain Platform V2 Beta, and enable a coffee retailer to ensure customers that their coffee is organic and fair-trade. 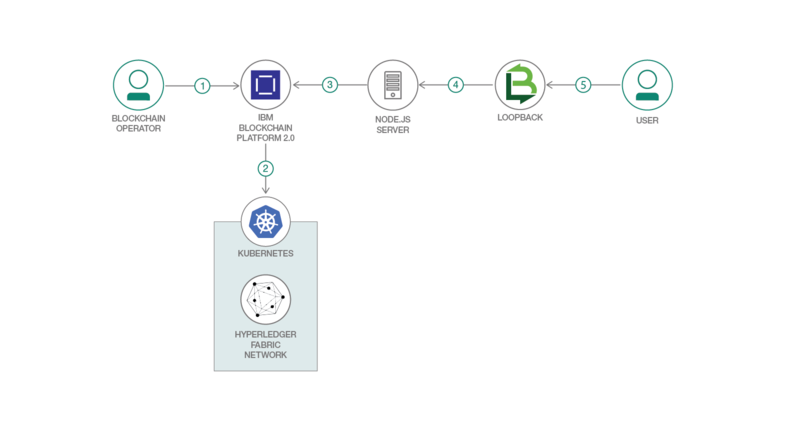 This code pattern can be useful to developers who are looking to learn more about creating applications that integrate supply chains with Hyperledger Fabric. The blockchain operator sets up the IBM Blockchain Platform 2.0 service. The IBM Blockchain Platform 2.0 creates a Hyperledger Fabric network on an IBM Kubernetes Service, and the operator installs and instantiates the smart contract on the network. The Node.js application server uses the Fabric SDK to interact with the deployed network on IBM Blockchain Platform 2.0 and creates APIs for a web client. The Loopback 4 client uses the Node.js application API to interact with the network. The user interacts with the Loopback 4 web interface to update and query the blockchain ledger and state.